Maryland is home to one of the most notable MD programs in the country, Johns Hopkins University School of Medicine, ranked 2nd in the nation for research by US News and World Report. Maryland is a rather ethnically diverse state, so there is an opportunity to serve a heterogeneous community. Maryland is also located near the District of Columbia and Philadelphia, so it provides an opportunity to network with other clinicians in bustling cities. With endless crabs and oysters, scenic views of Chesapeake Country, and beautiful beaches, is Maryland on the top of your applicant list? Considering applying to medical schools in Maryland? Sign up for a FREE 15 minute advising session with an admissions expert. 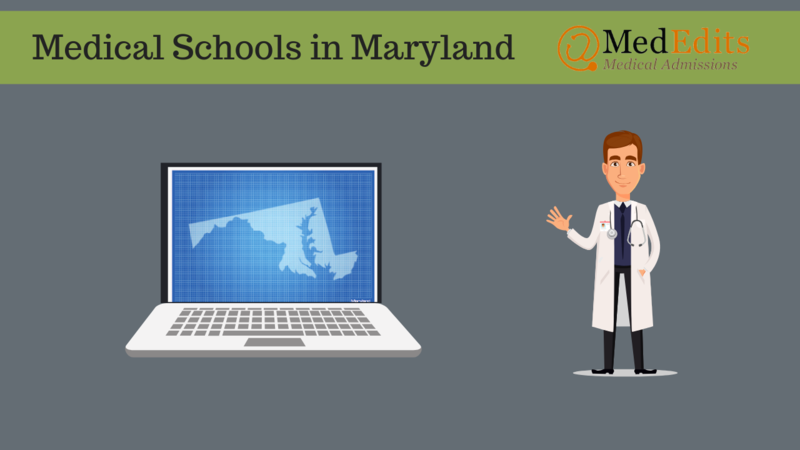 How Competitive are you for Medical School Admissions in Maryland ? To determine your competitiveness for a Maryland medical school, you must review the average MCATs and GPAs for accepted students as well as the medical school acceptance rates. For out of state students, it is important to pay attention to how many out of state students are interviewed and what percentage are in the entering class each year. So, how difficult is it to get accepted into a Maryland medical school? Let’s review the data. Below are the average MCAT scores and GPAs, interview rates for in state and out of state applicants, acceptance rates, percent of entering class that is in state, and tuition for all medical schools in Maryland. So, what can you do to increase your chances of getting accepted into a Maryland medical school? Maryland medical schools offer a broad range of GPAs and MCAT scores, so when evaluating how competitive you are, be honest with yourself. Are your MCAT and GPA close to the metrics for accepted students? If not, consider retaking your MCAT or enhancing your GPA. Maryland provides a unique opportunity for applicants, the Uniformed Services University of the Health Sciences F. Edward Hebert School of Medicine (USU) is the only tuition free medical school that pays students a salary to attend. The salary or monthly stipend amount varies from $2,175.00-$2,544.00, depending on marital status. That being said, USU is a military medicine track, which involves enlisting in one of the military branches and committing to serve at least seven years in the uniformed services after graduation.There is also additional service time which involves being placed on the Individual Ready Reserve (IRR) roster. USU is unlike many traditional medical schools, so look into the programs contingencies and weigh your options. More traditional medical routes, like those offered at Johns Hopkins University School of Medicine or the University of Maryland School of Medicine, also boast individualized dual degree programs, like MD/MBA or MD/PhD. Johns Hopkins University School of Medicine is one of the most revered medical schools in the world, meaning that it is very competitive. Remember to consult those averages before applying to save yourself some time and money. Apply to some schools that are below your averages as ‘safety schools’, some at your averages as ‘target schools’, and a few that are above your averages as ‘reach schools.’ This will give you a broad range of schools and increase your chances of snatching those priceless acceptances later in the cycle.